Howdy! That's what they say in College Station, home to the Texas A&M Fightin' Texas Aggies! Hehehe. To be honest, I am not particularly rabid about my college allegiances, but I did go to A&M (Class of 2010) and I had a blast there. 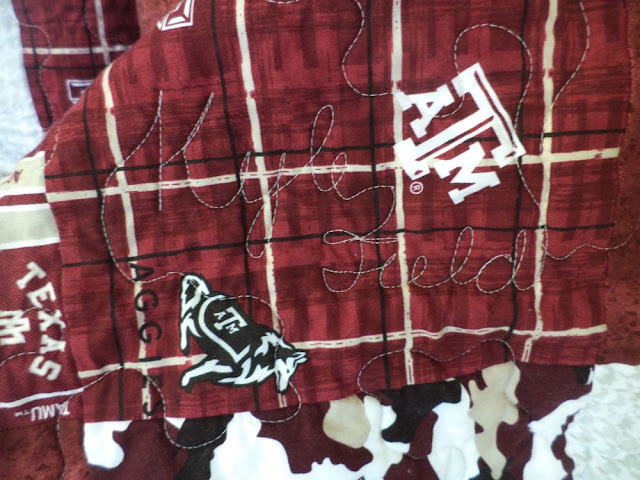 So when a friend asked me to make matching Aggie quilts for her nephews naturally I agreed. The two quilts are almost the same, excepting that the logos are mirrored color schemes and placed on opposite sides. 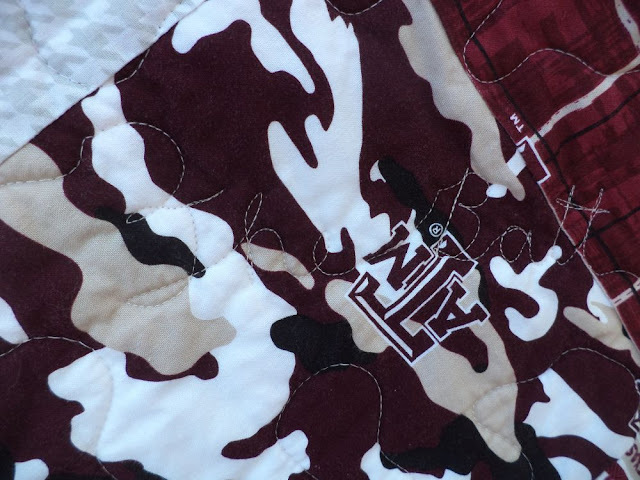 I found 3 A&M novelty fabrics and coordinating maroon and white tone on tones. Since these are for grown men I made them 56"x80". I would have gone a bit wider, but I wanted to avoid piecing the fleece backing which has a ~60" WOF. I made the two logo panels using applique/reverse applique. For more on the process see this post. I put an extra layer of batting behind all the letters, which made them stand up nicely. 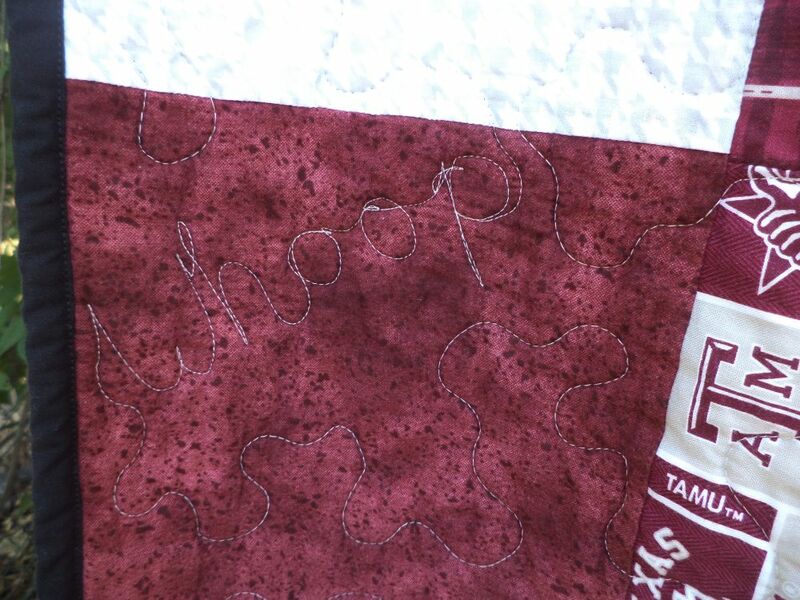 For quilting I did a stipple but mixed in words that are significant to Aggies. 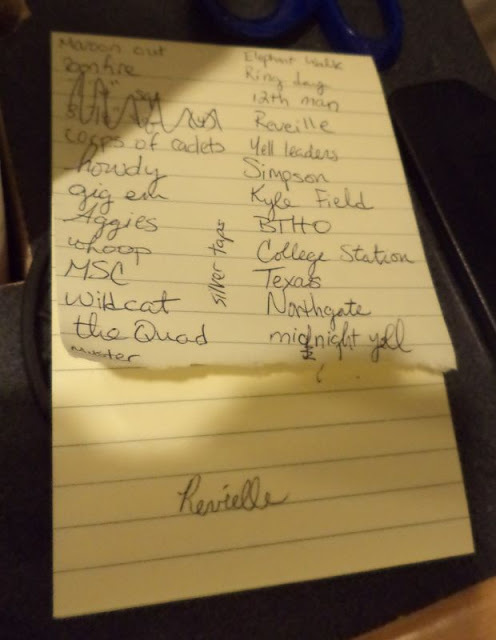 First I brainstormed a list which I kept by my sewing machine and mixed in as I went. I had to brush up on my rusty cursive! Aggies are famous for their excessive, some might say cult-like, obsession with a large variety of traditions. I had no shortage of significant sayings, people, places, and events to draw from. Kyle Field, our football stadium. BTW it's really hard to sew a cursive uppercase "F"
I did not try to keep the wording all going right side up; I just turned them every which way. These quilts will not be officially gifted until Christmas, but my friend is excited about them and anxious to give them to her nephews. I really enjoyed getting back into the whole Aggie "thing" again. Linking to Crazy Mom Quilt Finish it Friday. Great job with FMQ'ing the words. That's really hard! I tried to do "Roll Tide" on the border of the quilt I'm doing for my dad, but I ended up taking it out and just FMQ'ing some waves! I second ^^^! Fabulous job on the quilting (you're much more adventurous than I am!). Oh what wonderful quilts. I love how their similar but not identical and the words in the quilting are fabulous; they're going to have so much fun seeing what's "hidden" in their quilts! Gig 'em? Ha. I have a Texas A&M bull (I think) on a keychain from my trip to Houston in oh, 2007? I liked the burgundy... These are great quilts, and I can see possibilites for Michigan or Detroit Lions quilts for my family... Cursive writing is the best way to improve your FMQ I think. Sadly, these days, most kids cannot cursive write to save their lives. You did a great job! And ya, some letters, or like dots over an i are pretty hard to do!